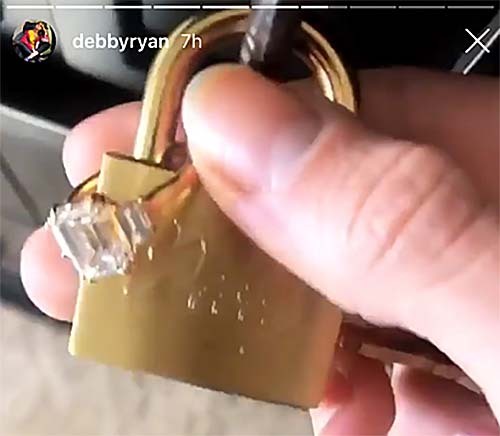 Actress Debby Ryan recently had some fun with her Twitter followers as she sought advice on how to keep her new diamond engagement ring secure on the set of Insatiable as she begins filming the second season of the Netflix comedy. 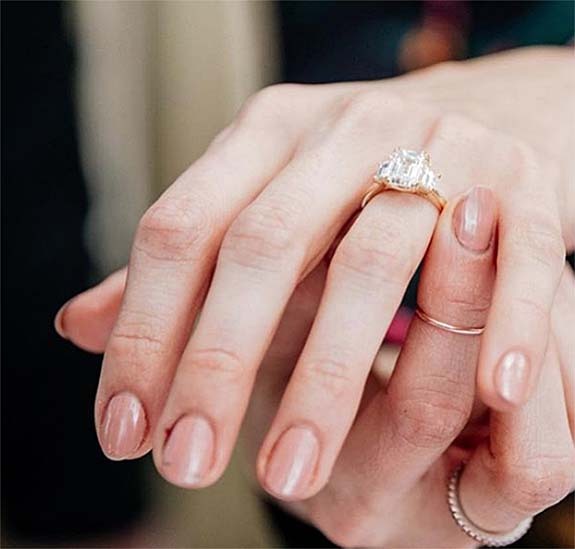 Ryan, 25, and Twenty One Pilots drummer Josh Dun, 30, were engaged just before Christmas, and the former Disney star proudly posted pics on Instagram of the bended-knee proposal and the emerald-cut diamond ring. Unfortunately, Ryan's character, Patty, is not engaged, so the ring can't be part of her on-set wardrobe. She clarified that her engagement ring needed to be stashed in a secure location, but not visible on camera. She was concerned about the safety of her ring because of the number of people who have access to the set. She also noted that her Apple Watch was stolen from her cast chair during Season 1. On Monday, as she began filming Season 2, Ryan shot out this message to her four million Twitter followers: "Hey actors and people who have to take your engagement/wedding rings off for work all the time, wyd [what do you do] with them??" Her question quickly generated more than 600 replies, some serious, some silly. When one Twitter follower suggested that she wear the ring on a necklace, Ryan responded, "No I can’t put it on a necklace. Where would young Patty get a chain with a thick engagement ring on it. Her mom doesn’t even give her money for dinner. And she’s a killer not a thief. Come on you guys." Twitter follower @popcornchams told Ryan that she should do what the actors do on the set of Grey's Anatomy: "Pin it to the inside of your shirt. Out of site, but safe and close by." Fan @DugyFresh had this novel idea: "Oh yes. You could even connect it to a cool lip piercing or mouth gauge so nobody would know your secret. If someone gets suspicious past that, say it's a training device for throat singing." To which Ryan clapped back, "Ohhh, this is a very good and novel idea. Been meaning to ask you, 'What’s that key ring looped between your molars?'" A few other practical-minded followers suggested that she should simply hide it in her bra, slip it in a sock, hire a bodyguard, leave it at home or place it in a safe in her trailer. Ryan wrote, "How do you bolt the safe down?" Twitter follower @onlyskeletons made this offer: "You can also contract me to be a ringsitter. I'll be safe with me. I'll take care of it. I'll feed and clean it." Ryan's Instagram Stories revealed how she eventually solved her dilemma. She slipped the ring onto a padlock and affixed it to an immoveable object in her trailer — although it was unclear from the photo exactly what it was locked onto. Follower @DelegardeLloyd assumed she locked it onto a dresser handle, sparking this snarky remark, "Saw what you did with your ring and I have to laugh." He noted that any determined thief could unscrew the handle and walk off with the ring. "Try again, ma'am," he wrote. At the end of December, just after Ryan accepted Dun's proposal and her new engagement ring, the pair turned to Instagram to share the news with their fans. 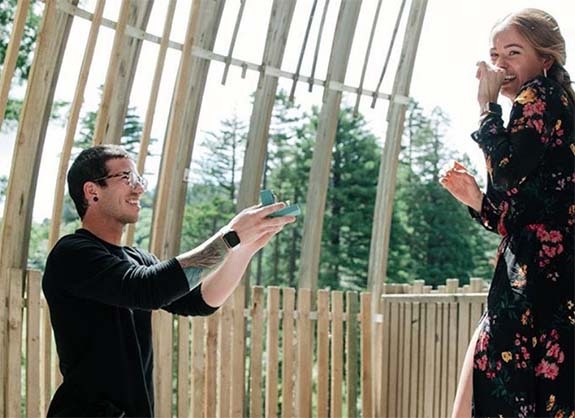 Dun wrote, "I found a tree house in the woods in New Zealand and proposed to my girl. She my dude for life. I love you Debby." Ryan and Dun have dated on and off since May of 2013. Credits: Images via Instagram.com/JoshuaDun; Instagram.com/DebbyRyan.